Need to know what kind of truck this is - and whether there's an HO scale version. Then "all I have to do is" figure out how to do the decals/lettering.... 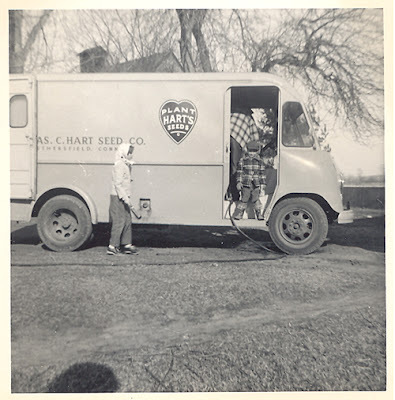 This wonderful image came from the Hart Seed Co. website. Too bad it's not in color - even if I had a truck I'd have no idea how to paint it. I'd guess the truck is painted a yellow/orange combo with a red heart logo. Could be wrong of course. I've seen something similar with a coal company's equipment and that's was it ended up being. Thanks Chris! I think you may be right with regard to the color - though I'm going to see if either John or Dave remember the actual color scheme (admitting that color memory can be faulty). Maybe an International Harverster Metro van as available in model form from Classic Metal Works? You're spot on Colin! Dave actually just sent me the same info - looks like that IH Metro van will fit the bill. Just need to see if there's one that's close in color scheme (so all I have to do is change the lettering %^) Thanks for stopping by!